There seems to be a common complaint that working on WordPress plugins and themes locally is difficult to accomplish. If you only need to manage a handful of plugins or a couple themes, the tedium of setting up a dev environment isn’t too complicated; you would probably just have a single install of WP on a MAMP server. As my 8th-grade english teacher would say: done, like a cupcake! Today, I would like to cover how I handle WP development locally. It’s not perfect, it’s not ideal and I am totally open to suggestions on ways to improve it. However, it does solve the biggest headaches I have with working on WP locally. No, really, that’s it. If you are reading this, chances are you probably already had *AMP installed, and all OS’s as far as I know come with some CLI that will do what we need to do. The first goal of this workflow is to be as DRY as possible with respect to our project files. We want there to be only one version-controlled instance of each theme and plugin. This even includes 3rd-party plugins which you can update via the WordPress’ Plugin Repository. First, the Clients folder. Inside here will be folders containing each of the clients you have projects with. If you manage multiple projects for the same client, you will likely want them grouped together, which this structure permits. Under ExampleCo you will find the project folder for www.example.com. This folder is a source controlled repository containing two directories, one for themes (allowing you to have multiple themes for a particular project) and one for plugins that are custom to just that project. You will notice the example theme and foo-widget plugin contained within. Our Plugins folder contains our custom WP plugins that are shared across projects. 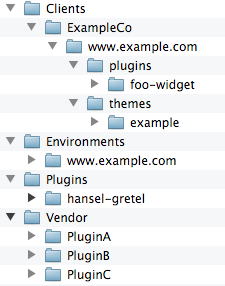 Each plugin directory in here is a repository linked to either the WordPress SVN or another SCM service. And finally, the Vendor directory collects all our 3rd-party plugins or themes as repositories. This is essentially the same as the Plugins folder, but contains projects you do not actively maintain or contribute to. If it doesn’t bother you, you could probably combine the two. Our first step will be getting WordPress up and running for our dev environment. In the www.example.com folder in Environments, we will download the latest version of WordPress. Start up MAMP and click Preferences. 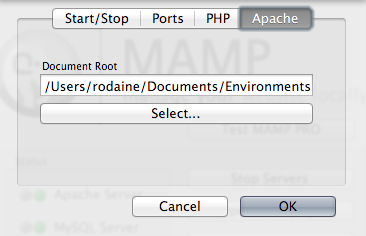 In the preferences modal, click Apache and the only setting available is to change to the document root. Point it to the folder in Environments and click OK. The Apache and MySQL servers will restart automatically. When you have multiple environments configured, you will need to change the document root to switch between them. If you find this to be tedious, purchasing and setting up MAMP Pro (or a bit more manual work beyond the scope of this article) will allow you to run multiple local environments simultaneously by giving them different URLs (eg, example.dev, foobar.dev). It’s your call, but I find that I can only do one thing at a time, and having to manually switch keeps me focused on the task at-hand. Also, you might find it annoying that there are multiple identical installs of WordPress side-by-side. Trust me, I think it’s gross, too. However, this will give you the opportunity to debug issues related to the WordPress version you are running. For instance, when WP updates, you will want to test that the update doesn’t break any features on the live site before you go and hit that upgrade button. Likewise, it’s a good habit to test your plugins on beta versions of WP to ensure there are no regressions resulting from those changes. It certainly beats the ire of everyone who has your plugin or theme installed overloading your support forum when you neglect to remove deprecated code. Now we need to add a database on the MySQL server for this particular environment. When starting up MAMP, it will give you easy access to a phpMyAdmin instance for your MySQL server, or you can use a nice native tool like Sequel Pro to create the database. We’ll name it example_wordpress. With the servers configured and ready, we can now install WordPress. Access your environment on your localhost (at whichever port MAMP is configured to run at) and WP will walk you through the process of setting it up. If all is said and done, you should have WordPress running locally on your machine. Hooray! Alright, the moment we’ve been waiting for! How do we include our plugins and themes in the environment without having a configuration mess? The answer: symoblic links. Symbolic links, or symlinks, are similar to Mac’s aliases or Windows’ shortcuts in that they a reference to a directory (or file) in a different location, but unlike either, they actually affect pathname resolution. What does that even mean?! Simply put, it means that WordPress (a’la PHP and Apache) will be able to find and use the files in these links as if they were actually included in the environment. Wikipedia can elucidate symlinks further, if you are curious, but for the purposes of this discussion, believe me when I say they just work. Getting the paths into Terminal can be annoying, but a handy shortcut for quickly adding paths to your command is to drag and drop a directory or file from Finder into Terminal. Its path will automagically be added to the end of the current command! The ln command by itself will create a hard link which is not what we want. The -s flag tells it to make a symlink instead. The target_path is an absolute or relative path to the target folder you want to link to; it sometimes helps to think of it as the source. The link_path is where you want the link to exist; again, I like to think of it as the destination. So, to get our example theme into our environment we would execute the following in Terminal. If you check Finder, you should see the alias arrow icon on the directory icon for the example theme inside the environment. Again, just to be clear, it’s not an alias though, but the icon lets us know we did it correctly. Of course, there is a catch. Actually a couple. Unfortunately, there are no easy ways around these, but there are workarounds to make them less of a burden on your workflow. WordPress has many settings right out of the box. Don’t believe me? After a clean install, there are already 99 entries in the options table (where the settings are stored). The vast majority of plugins that have options will also make use of this table, not to mention any custom tables they also add. Widgets, menus, nearly everything is maintained by the database (understandably), so how on earth do you keep the production and dev environment databases on the same page? For plugin development, this is a non-issue. Your plugins should behave independent of everything else, regardless of where it is installed. Custom themes, on the other hand, are much more reliant on the site settings for certain features (like navigation menus). In these cases, having a copy of the database on your dev machine closely matching the live site is ideal. You have a couple of options to tackle this issue. The first: manually copy the database from the live site to the dev site. This process is, in a word, unpleasant. You also need to take care in changing some of the values in the tables to refer to localhost as oppossed to the actual site domain. No one likes the first option. The second, and more reasonable option, is to use a plugin like WP Migrate DB Pro. You install the plugin on your production and dev sites and click a single button to sync the databases. It’s as easy as that. Don’t just take my word for it, though; Chris Coyier loves it. It costs a bit if you are managing more than 6 sites, but considering the time it saves, the expense is well justified. For me, this has been the biggest gotcha. Here’s the deal: anywhere a plugin or theme makes reference to the filepath, in particular the __FILE__ magic constant, there is a chance your code will break. From experience, calling plugin_dir_path(__FILE__) in a symlinked file works out fine, while plugin_dir_url(__FILE__) does not and will return an erroneous URL. First we check if we’re running locally in SLEIGHT_LOCAL. While SLEIGHT_PUBLIC_PATH is unaffected, the URL version is. If we are local, we use plugins_url() instead to get the absolute URL for the plugins folder (usually just ‘/wp-content/plugins’) and hardcode in the full path to the directory we want. Not too bad, right? If you wanted, you can drop the check altogether and rely on the plugins_url() method. Thanks for sticking in there! I’ve found this local workflow to be a great time-saver and overall keeps projects nice & tidy. Give it a try and let me know what you think. I am totally open to suggestions on how to make this even better.